The summer weather is finally here and naturally thoughts turn to fun days out, holidays and feeling the wind in your hair! What better way to enjoy the fresh air than investing in a soft-top car? At Imperial Car Supermarkets, we have a whole host of convertibles. from the cute Fiat 500 with its convertible sunroof, to a range of Volkswagens, Audis, BMWs and Mercedes with soft tops. All of the used cars we sell are RAC checked and are of the highest standard. 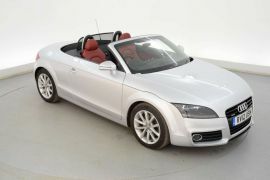 We love the sporty upmarket Audi TT, how about a model with red leather seats for guaranteed fun times? The outstanding Mercedes E Class Convertible comes packed with high spec extras and that ‘all important’ electric roof. We have several of these vehicles to choose from at the moment starting at under £12,000. BMW have a range of stunning convertibles cars including the Series 3, Series 6 and Z4, all of which we have in stock for sale at Imperial Car Supermarkets now. Remember every used car we sell has been quality checked by the RAC, you can view the vehicles in detail on our website inside and out and even check the vehicle documents. What are you waiting for, why not check out the range of convertibles we have in stock at Imperial Car Supermarkets now? We have showrooms in Northampton, Southampton, Fleet on the M3 and Portsmouth.